BIG news!!! 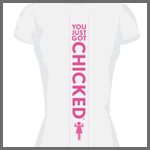 CHICKED is feature in a MORE magazine as one of the “funniest running shirts”! I can’t decide if it’s “funniest” for the person wearing the shirt as they CHICK — or the person getting CHICKED!